When I've been asked what I would love to collect, it's always been something Disney. 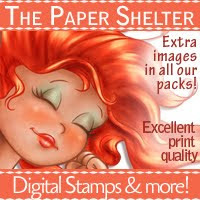 I love everything about them from Mickey Mouse, to Tinkerbell (my personal favorite! ), to the Princesses. 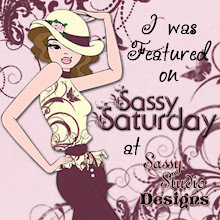 When I saw this Little Honey's Holiday Belle image from Sassy Studio Designs, I had to have her! She was my Tiffany's favorite movie and it's my granddaughter, Allie's, favorite too! Wish I had a nickle for everytime I watch or listened to Beauty and the Beast! 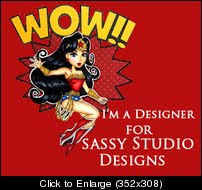 Today, Sassy Studio Designs is sponsoring a couple of challenges, Challenges 4 Everybody, where it's Anything Goes, and Glitter n Sparkle Challenge Blog, where the theme is Christmas/New Year's. 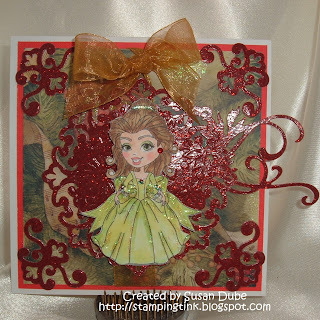 I thought this sweet Little Honey's Holiday Belle would be perfect for both! Isn't she just a doll? I think she looks like her own perfect ornament on a Christmas tree. She's colored with copics and has Stickles all over her bow and flowers and cuffs. The papers are from K&Company's gorgeous Christmas stack and the red glitter corners and swirls are from Spellbinders's and the gem and ribbon are from my stash. Gosh, I love her sweet face! 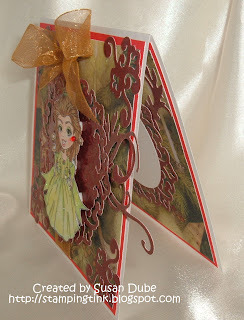 Here's a couple of side views for you to give you a peek on what's inside. And Judy, here's an inside. 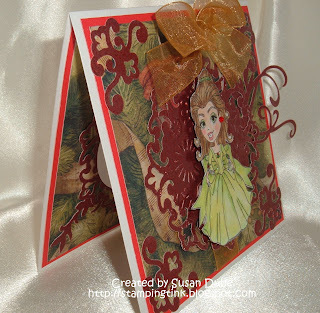 I just am in love with this paper! That's it for today. I hope everyone has a great last day of the weekend and is relaxing and putting the finishing touches on the holiday preparations. 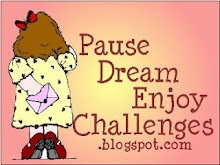 Make sure to go on over and join in on the two challenge blogs and show them some love! Absolutely Gorgeous. 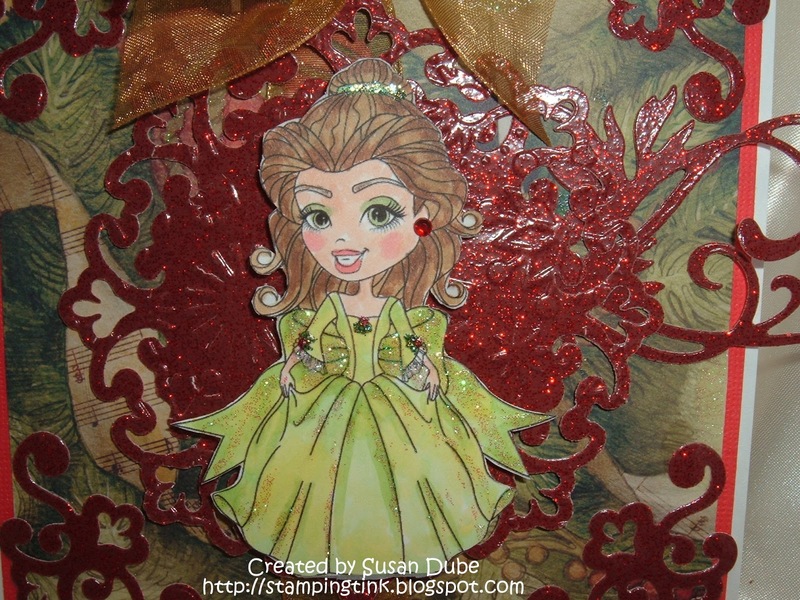 I love the way you colored Belle. I love disney too. I collect the Princess Snowglobes. Susan, this card is so cute! Love the sparkle (of course, right?). 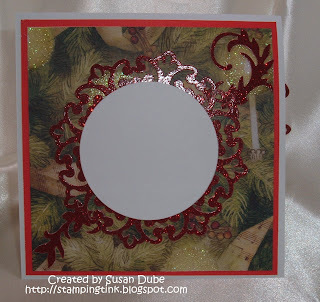 What great red flourishes and added ribbon too. This is gorgeous!! I love it!! Especially the dir cut!! Thanks for joining us this week ar Glitter n Sparkle..
grate colouring love it,thank you for joining us at challenge 4 everybody good luck and hope to see you again soon.